Wallpapering Fog: You can't fix a bad product with marketing. Not even if you're Disney. You can't fix a bad product with marketing. Not even if you're Disney. 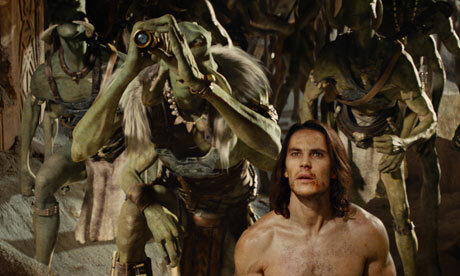 Disney's latest effort, 'John Carter' looks set to be one of the biggest box office flops ever, losing in the region of $200m. Who'd have thought that a plot about an American Civil War veteran, transported to Mars to fight in another (presumably more Martian) war, wouldn't hang together as a film? Unbelievable. Once the film was complete, Disney must have realised that they'd got a problem. Rough cuts of films are tested to see if audiences like them and so that they can be tweaked to get a better final product. If feedback from that early research looked anything like the Rotten Tomatoes reviews of the film, then Disney will have known pretty early on that they had a failure on their hands. Take this contribution, from the Guardian's Peter Bradshaw. "I felt as if someone had dragged me into the kitchen of my local Greggs, and was baking my head into the centre of a colossal cube of white bread. " Like Private Garlick in Good Morning Vietnam, "I have no idea what that means, Sir, but it sounds pretty negative to me." Depending on which source you believe, Disney has spent somewhere between $50m and $100m marketing John Carter, almost certainly based on - at best - lukewarm pre-test results. This never, ever, works. It's a golden rule of marketing that you cannot persuade a lot of people to buy a bad product by spending more on advertising. The first person who falls for it will tell all his mates that you lied and you've just wasted $100m. In the end, this is a sign of whether a company really believes in research and is willing to follow through on the consequences of what they know. Any company that throws this amount of marketing money at a bad product, at its core, doesn't want to believe the research that it commissions. Disney hasn't just wasted $100m on marketing, it's wasted a smaller amount finding out ahead of release whether anybody likes their films too. But on the flipside, there are companies that follow research to their doom and find out later that compromising for everyone creates something bland. Companies have to take risks and this, obviously, was a risk. I applaud Disney for trying to create something new and sticking to their guns by putting marketing budget behind it. Film is probably awful, but at least they didn't spend the money making yet another tired but profitable sequel (not sure what number Shrek is now at). Very true. I wouldn't ever try to set what films should be made using research. It might help, but definitely shouldn't be the only source of ideas. Once you've taken the risk and made a film though, research can tell you if it's a good one. The problem I've got isn't with the risk taken in making John Carter, it's the $100m Disney spent marketing it when they must have already known that this time, the creative gamble hadn't come off.